Duplicate prospects can waste time and frustrate recruiters. 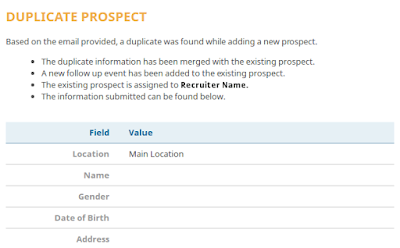 Therefore we've added several new features to help recruiters and administrators deal with duplicate prospects. As of today ampEducator will no longer accept the addition of a new prospect if its email address has already been used. Prospects with similar names and phone numbers are possible but it's highly unlikely that two different prospects will share an email. Note that if you are editing a prospect and get an error saying that the same email already exists, you will need to merge all prospects with the same email together before proceeding. Select the prospects under the 'Prospect List'. Click on 'Merge Selected' under More Actions. The information from the other prospects will be merged into the primary prospect and the other prospects will be deleted. The information merged includes any fields which are missing in the primary prospect, emails, events, letters, documents and notes. When adding a new prospect you will now see the prospect name, email and phone as the first three fields. As you enter details the application will search for any possible prospects and show you the possible number of duplicates. You can get further details by clicking on the number of duplicates. The new add prospect page with the duplicate indicator. Any requests coming into ampEducator using the built in form submission are now checked against the existing prospects for a duplicate email. If a duplicate email is found the new information is merged with the existing prospect and a new follow up event is added for the recruiter. This amends the existing prospect without creating a duplicate and lets the recruiter know that they should be following up with them. We've also updated the new prospect notification emails for recruiters. The emails have been styled to make them easier to read and now indicate whether or not the prospect submission was a duplicate. The format of the new prospect added notification email indicating a duplicate prospect. If you have any questions, comments or concerns please email us at support@ampeducator.com.